DELMAR – Jennie M. Cady Bink Woltjen, 93, of Delmar, entered into eternal rest on Tuesday, September 27, 2011 at the Good Samaritan Lutheran Health Care Center. She was born in Sloansville, NY, July 19, 1918. 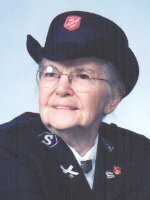 She was a lifetime member and volunteer of the Salvation Army, and worked primarily as a Governess for newborn children. Mrs. Woltjen was predeceased by her loving husbands Kenneth R. Bink, Sr., and Walter W. Woltjen, Jr. She is survived by her son Thomas R. Bink (Martha); her daughter Caroline G. Erpelding; her daughter in law Renee Bink; her sisters Marietta Denny, Elvira Davis, and Jeanette Martin; her grandchildren Tammy Crasto, Patricia LeBlanc, Edward and Kenneth Bink; and by several great grandchildren and many nieces and nephews. She was predeceased by her son Kenneth R. Bink, Jr.; her grandson Donald Bink; her son in law Archie Erpelding; her sister Louise Hans; her brothers James and Edward Cady; and her brothers in law Hubert Hans, Raymond Denney, Ernest Davis, and Robert Martin. The family would like to thank the many caring and compassionate staff members of the Good Samaritan Lutheran Health Care Center and Community Hospice for the wonderful care they gave to Mrs. Woltjen. Funeral services will be held in the Hans Funeral Home, 1088 Western Ave., Albany, Saturday morning at 9:00, with Rev. Frank O’Connor officiating. Relatives and friends are invited, and may call at the funeral home Friday from 4-7 p.m. Interment will be in Albany Rural Cemetery, Menands. To leave a message of condolence for the family, send a sympathy card, or obtain directions to the funeral home, please visit www.HansFuneralHome.com .